There are places in Bulgaria that we know so hardly. We visit important historical places and we still do not know much about them. Some of these are just not well studied and their glory is hiding somewhere beneath. Here we are on a hot spring day in Veliko Tarnovo – the glorious capital of the Second Bulgarian Kingdom, once a legendary city that has preserved much of its glory even until nowadays. We are now at the foot of Trapezitsa hill – once the second most important fortress in the capital. It was recently renovated and open for visitors so we are curious to discover it. How to reach Trapezitsa hill? A very nice feature of Veliko Tarnovo is that most of the interesting sites are located on hills and are visible from many parts of the city. Trapezitsa is well recognisable from the entrance to Tsarevets hill and also from the terrace near the cathedral “Nativity of Virgin Mary”. However, the entrance to the hill is at the other side, the northern part, which has always offered the easiest access to the hill. It is easiest to reach the entrance to Trapezitsa by car. The entrance to the hill is located in the Asenov quarter of Veliko Tarnovo and there are signs in the area. Also, any GPS like Google Maps would easily find the spot. If you prefer public transport, you can use buses 50 and 110 to Asenov quarter. You can go up to Trapezitsa by two means – the funicular and walking. Just next to the lower station of the funicular, there is a spacious free parking lot. Nearby starts also the path leading to the top which you should take if you prefer walking. Many visitors choose to go up with the lift and come back walking. For us the funicular was very convenient and we would recommend it to anyone travelling with young children or having problems with hiking. Just have in mind that the funicular has limited working time. It is open only in the summer season, from May to October. We caught it on its first operating day for this year – May 1. The lift is open from 9 to 17 h, excluding Mondays. Also, have in mind that it might not be operating in strong winds, rain or very hot weather. The lift itself is air-conditioned and little Anna really enjoyed the 3-minute journey. Tarnovgrad (today’s Veliko Tarnovo) was a capital of the Second Bulgarian Kingdom between 1185 and 1393. Finally, it fell after a 3-month siege by Ottomans led by the son of sultan Bayezid I – Suleiman Celebi. 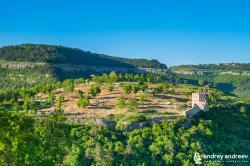 It is said that once Tarnovo was considered the most important city after Constantinopole. During its 208 years as a capital, the city became the most important cultural, political, religious and economical centre of the Second Bulgarian Kingdom. It spread on the hills Trapezitsa, Tsarevets, Nov grad (the neighbourhood by the river) and Devin Grad, as well as the neighbourhoods between them. The hill we know as Tsarevets today was then called Tarnov. Tsarevets fortress was built on an existing Roman fortress. Trapezitsa was a usual neighbourhood with both rich, poor and middle-class inhabitants. Devin Grad was also an old Roman fortress and Sveta Gora was the centre of religious life. Another important part of old Tarnovgrad was the neighbourhood along Yantra river, where is the Holy 40 Martyrs church. Trapezitsa was naturally hard to access, also well-fortified and acted as one of the emblems of the capital. Tens of churches and several monasteries existed there. Trapezitsa and Tsarevets were connected by a bridge near the St. 40 Martyrs church. It is believed that in 1195 Tsar Assen I brought the remains of Saint John of Rila from Sredets (Sofia) to Veliko Tarnovo. And they were buried on Trapezitsa, in the designated church now known under number 8. It is also the largest church on the hill. Together with it, 18 more churches were present on the hill. The glorious Trapezitsa was probably abandoned intentionally and in an organized matter after the city fell under Ottoman rule. Despite being buried for so long, Trapezitsa stayed in the memories of Bulgarians. So just after the Liberation of 1878 was created a public entity named to discover and excavate historical places like Trapezitsa. During the Ottoman rule, Tsarevets hill was inhabited by Turks and Bulgarians rarely went there. Even if they did, they could only see Turkish houses and a mosque. This is why most people believed that Trapezitsa used to be the most important hill of the capital with its preserved remains of churches and boyars’ houses. Therefore, it took many years after the liberation to Bulgarians to discover where the real royal life was happening. The first excavations began on Trapezitsa. However, they were quite chaotic and many artefacts were destroyed by mistake. The earthquakes in the area in early 20th century also contributed to the destruction. We honestly admit that we were not prepared for what we found on Trapezitsa. We expected more like a park for walks, because not many of the interesting places can be seen from the surrounding hills. However, just after we stepped down from the funicular, the rich history of Trapezitsa was revealed in front of us. Closest to the starting point of your walk is the Northern gate, where you can see a restored part of a defensive tower and a military complex. Just nearby you will find the first remains of churches. Actually, the churches are the ones that left the most important track in our minds about Trapezitsa. We pass by first, second, third church and feel how we are getting lost in this historical quarter, so rich in divine energy. We visit each church separately, read the information about them and amusement fill us. It is difficult for us to remember every church’s name. For scientific purposes, they are also numbered. Some of them are small ones from which only the foundations have been preserved. Others are larger, with preserved frescoes and mosaics. Besides saints, on the frescoes you can also see the faces of Bulgarian rulers. The churches with frescoes are carefully covered in order to preserve them. The areas around them feature alleys and benches if you need to have some rest during the walk or just want to enjoy the serenity of the area. We sit for a while and try to imagine how Bulgarians used to sit around, talk to God and share every moment of their life with Him. Walking down the main alley, we reach the Southeastern tower – gate of the fortress which has now been partially reconstructed. There you can climb the stairs up and imagine how soldiers once lived and protected the hill. We wonder how such a hill could be conquered after all, even without the defensive complex? However, once the world was very different and obviously this was possible. Then we head to the newly build museum on the hill to search for answers. The newly built museum is located just on the main alley, near the upper station of the funicular. There you can see an interactive exposition of the history of Tarnovgrad, together with some artefacts discovered in the area. It represents the glory of the Second Bulgarian Kingdom. We spent only around an hour on Trapezitsa because of the hot midday sun and the high temperature. However, we had a wonderful walk through the history of this glorious place. Even though some of the now existing constructions on the hill are not authentic, they help us imagine what Trapezitsa looked like in its glorious times. This is why we fully support the decision for reconstruction of the fortress and are truly happy to have the opportunity to visit it.